Finishing up the Chicago area colleges on Jack's initial list, Sharon and Jack spent the morning at Loyola University Chicago. After sitting through an hour presentation, they took a tour. Sharon noted that this was the least polished of the four presentations of the last couple of days. 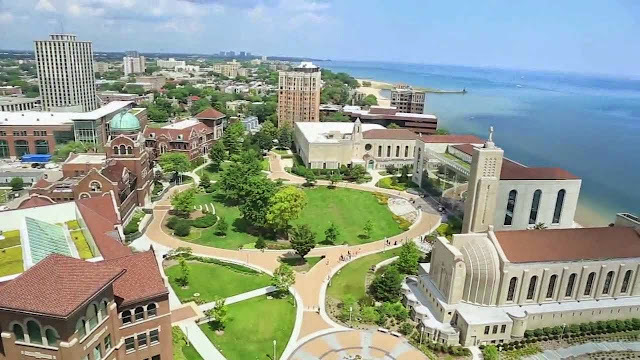 Loyola is much easier to get into than most of the colleges on Jack's list. It represents one of a number of possible safety schools that we will be touring over the next few months. Like Northwestern, the campus is right on the lake. They spend the afternoon wandering the Art Institute of Chicago and having a light lunch at the museum. Jack sought out a number of pieces that he has studied in his art appreciation classes. They returned the rental car back at the airport about 5 pm. After eating dinner, they caught a 7:10 pm United flight to Sacramento. They were on the ground in Sacramento a little ahead of schedule at 9:45 pm. Waiting in the cell phone lot, I picked them up at the curb after they collected their luggage. All in all, it was a very successful trip. We will be doing a longer college tour on the east c0ast in early August after Jack finishes up at the Wharton Sport Business Academy.